Out of hundreds of potential choices, competitive Pokémon players can only bring six Alolan monsters into a battleground. Three months in, despite the uncertainty of the overall metagame, some picks are turning up more often than others. With access to one of the most powerful Earthquakes in the game, great speed and solid coverage moves, this dragon can threaten a wide variety of Pokémon in the metagame. Every common set seen so far this year has been offensive, though some let it hold onto an Assault Vest for extra bulk. However, the most common item by far is Groundium-Z, which lets Garchomp use Tectonic Rage (a move more powerful and useful than Earthquake) to devastating effect. Choice Scarf has been picking up steam as well, as an option to make Garchomp fire off Earthquakes before Tapu Koko can move. Attack-wise, Poison Jab is almost required this year so Garchomp can hit the Alolan Guardian Deities for super-effective damage. The last attack slot varies, and Dragon Claw was the winner at the start of the season when Tapu Fini and Misty Terrain were nowhere to be seen. However, many players have since moved to either Rock Slide for spread damage and flinches or a fire attack (Fire Fang or Flamethrower) for Celesteela and Kartana. 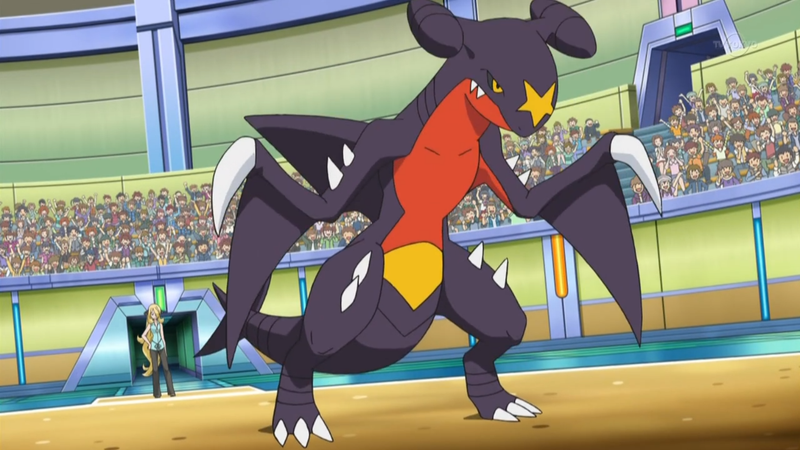 Just be sure to respect Garchomp’s quick, powerful attacks or watch it put your team in the ground. While many players have complained about how annoying Celesteela can be, Porygon2 is arguably worse. While holding the Eviolite, its defenses are boosted to stupid levels that let it eat up attacks like they’re nothing. Most Z-moves fail to get anywhere close to a KO, and even doubling into it with two attacks often comes up short. Only the fighting type All Out Pummeling can OKHO this cyber-duck reliably. Aside from soaking up damage, Porygon2 sets up Trick Room. This enables itself and the rest of its team to move first. With the speed advantage, Porygon2 likes to heal back 50 percent of its HP with Recover, forcing players to keep attacking it. When it isn’t setting up or healing, it can use a variety of coverage moves to do decent damage. Porygon’s Download ability, which boosts its attack of special attack depending on the Pokémon across from it, also helps its otherwise meager damage output go a little farther. Ice Beam is a common attack for knocking out Garchomp and Kartana, but Thunderbolt and Tri-Attack are used as well. More recently, some players have started running Return, a powerful physical attack, to make use of the otherwise useless attack boosts that Download sometimes grants. All of that adds up to make for a Pokémon that is as frustrating as it is useful. Taunting it to stop Recovers and Trick Rooms is the easiest way to deal with it, but not every team runs that move. Instead, sometimes it is best to ignore it and focus on its partners. When its the only thing left starting down two opponents, it often has a hard time surviving. However, don’t think that beating it one on one is easy. Porygon2 will slowly wear most Pokémon down while recovering as needed. Arcanine used to be niche, but this year is different. As fire types in the Alola-dex are limited, none of the choices have the same utility as Arcanine. First, Arcanine’s Intimidate ability lowers opposing Pokémon’s attack, and this can stack with clever switching. On top of that, Arcanine has great stats across the board, with high attack and special attack stats in addition to considerable bulk. For offensive sets, Arcanine’s 120 base power Flare Blitz can melt big threats such as Kartana, Celesteela and Ninetails with ease. Arcanine also usually comes with Wild Charge, a powerful electric attack that can be used to hit threatening water-types such as Tapu Fini and Araquanid for super effective damage. Rounding out most offensive sets is Extreme Speed, a strong attack that has priority over almost everything else in the game. Item-wise, many Arcanine are running Z-crystals to deal massive burst damage. Bulky Arcanine sets play a more supportive role. They still carry Flare Blitz, but they use Snarl more often. This attack hits both opposing Pokémon and lowers their special attack stat. Between this move and Arcanine’s Intimidate ability, it can neuter the damage output of any team given enough time. Will-o-wisp is often run in the third slot to burn foes and cut their attack in half. Roar, which forces a Pokémon to leave the field, is also common as a way to stop teams that want to set up Trick Room or status boosts. For items, most run either a Sitrus Berry or one of the Super-Sitrus Berries (Figy, Iapapa, Wiki, Aguav, Mago). The former recovers 25 percent HP once the holder reaches half health while the latter recovers 50 percent HP once the holder reaches a quarter health. Basically, Arcanine is an extremely versatile Pokémon with great stats and an amazing ability. While the debate still rages on over which is the best guardian of Alola, Tapu Koko is tied for the second fastest Pokémon in the 2017 format. Speed allows it to automatically set up the powerful Electric Terrain to help its attacks hit 50 percent harder. It also has two of the game’s best offensive types in electric and fairy. That combo is especially potent this season since the two most common ground types (Garchomp and Krookodile) are weak to fairies. As a trade off, it’s very frail and can’t live more than a couple attacks at most. Players are also split on whether to use Tapu Koko as a glass cannon or in a more supportive role. While most of Tapu Koko’s best moves are special attacks, its attack stat is a bit higher. The boost from Electric Terrain makes up for this a bit, but players have had to find other ways to get more damage out of Koko. Life Orb has been the most common way to do that, with Thunderbolt, Dazzling Gleam and Discharge as the main attacks. Some also run different Hidden Power type attacks depending on the needs of the team. Z-Crystals are another item option, giving Tapu Koko the opportunity to do big damage with a Gigavolt Havoc or Twinkle Tackle. The supportive options can often be slotted in as needed, letting Koko do damage while helping out the rest of the time. Volt Switch is a common attack that lets Koko switch off the field for a more useful ally, and its supreme speed often means it will get out before taking damage. Others run Sky Drop, which removes an opposing Pokémon from the field for a single turn. This is used to remove a threat temporarily while Koko’s partner handles whatever is left behind. Nature’s Madness and the Z-attack Guardian of Alola can also be used to remove either 50 percent or 75 percent of a target’s HP, setting up Koko’s partner for the KO. Finally, having a fast Taunt-user is always helpful to shut down other supportivePokémon. In short, Tapu Koko is a great, speedy pick that can provide potent offense or handy support. Kartana has an obscene 181 attack stat but a measly 31 special defense, meaning that a strong wind could knock it over (apt, considering it’s basically made of paper). It doesn’t sound great on paper, but eventually people realized how to work with Kartana’s strengths. Kartana’s Beast Boost ability raises its highest stat whenever it gets a KO, and it also gains survivability with an Assault Vest. It has became such a threat that some players started running whatever fire move they could on Pokémon with a slot to spare (like Flamethrower on a physically attacking Muk). Kartana sets are extremely straight-forward, though. They all run Leaf Blade and Smart Strike, and the vast majority round out the third slot with Sacred Sword. Assault Vest variants tend to run Night Slash in the last slot, to cover threats like Marowak, but Razor Leaf has been seen for spread damage. Those holding a Focus Sash, however, run Detect over Protect. This is done to cover the rare opportunity a player faces a team running the move Imprison, which restricts opponents from using any move the Pokémon using it has. It’s also worth mentioning that some daredevils have been letting Kartana hold the Choice Scarf for a surprising speed-boost. However you run it, Kartana can tear through an opponent’s team—as long as you protect it. You can watch a good Kartana match in action here: Drew Nowak v. Collin Heier at Dallas Regionals. When the season started, almost every VGC player called Tapu Fini the worst of the four guardian Pokémon. It has a great Water/Fairy typing and considerable bulk, but it couldn’t really hit that hard. Well, Enosh Shachar proved everyone wrong early in the season at the San Jose Regional Championships. He tore through the field with his Tapu Fini team, going undefeated on day one and ending up the overall favorite to win. While he did make it to the finals, he lost to Gavin Michaels in a close, three-game set. Still, he’d done enough to prove that Tapu Fini was far from the worst by demonstrating how its bulk can help it set-up game-changing boosts. By raising its special attack and special defense stat with Calm Mind, Fini gets even more bulk and can dish out big damage with Muddy water or Moonblast. After Shachar convinced players to give Fini a chance, Collin Heier and Sam Schweitzer made a deep run at the Dallas Regionals with Choice Specs Tapu Fini. This bypassed the turns spent boosting and just fire off powerful attacks right out the gate. Then, World Champion Wolfe Glick used a Swagger, Heal Pulse Fini to get top 8 in Athens, Georgia. The goal there is to exploit Tapu Fini’s Misty Terrain to block any kind of status conditions from affecting grounded Pokémon. Swagger normally boosts the target’s attack twice at the cost of being confused, but the confusion isn’t a factor with Fini. So, Glick could make his partner hit twice as hard and then keep restoring their health with Heal Pulse. Celesteela’s impact on VGC 2017 is well documented, so there’s no need to beat a dead horse. However, it’s still important to include this ultra beast on the list and note how it has developed in the metagame. To start, its usage has definitely gone down with the rise of Arcanine and the continued presence of Tapu Koko. Plus, with Garchomp as popular as it is, it isn’t always safe to bring Marowak as a partner. However, in an attempt to help Celesteela live more special attacks on its own, some players have started running it with Assault Vest. They’ll then slap on four attacks, such as Flash Cannon, Flamethrower, Giga Drain and Air Slash for special attacking Celesteela. Then, they bulk through the damage, pick up knock outs and use Beast Boost to increase their damage-dealing stat. This way, they’re able to compensate for some of their lacking longevity with offensive pressure. People still run standard Celesteela, too, but it takes consistent, intelligent play to utilize the Substitute, Leech Seed, Protect, Heavy Slam set well. Since everyone and their mother knows what it does now, the average player might find their opponents playing around it much easier. The third and final Tapu on the list (sorry Tapu Bulu), players are still trying to figure out how best to use Lele. At the start of the season, most were exploiting the huge damage potential it offered by combining a Shattered Psyche with a 130 special attack stat and Psychic Terrain. And even after it launched that powerful attack, Lele could still hit plenty hard with a regular old Psychic or Moonblast. There were two problems with this strategy, however. One: it was easy to switch in a dark type Pokémon, such as Muk, and take zero damage. Two, it isn’t too hard to simply outspeed Tapu Lele and knock it out first. In response to that, Tapu Lele’s usage died down a bit. Lately, though, people decided the best way to get around the problems is to slap a Choice Scarf on Lele and not go all in on the z-move. By trading off the ability to change attacks for a 1.5-times speed boost, Tapu Lele can pick off or soften up opposing Pokémon before they can move, allowing its partner to mop up whatever is left. Again, the threat of Lele can be mitigated with good switching or a well timed Protect, but scarfed Lele don’t lose as much when an attack doesn’t go the way they planned. They can either try again next turn or swap out and bide their time. Those sets all run Psychic, Moonblast, Dazzling Gleam and usually Thunderbolt to cover Lele’s biggest threat, Celesteela. When it comes to dealing with Lele, a strong Poison or Steel attack will usually do the trick. Kartana and Celesteela, in particular, love rolling over Lele and snagging an easy Beast Boost. Muk or even Garchomp can do big damage with a Poison Jab and various ghost types can grab knock outs with their strongest STAB attacks. Still, even if Lele goes down quick, it can protect its partners from priority moves with Psychic Terrain’s secondary effect. If you can keep Tapu Lele safe long enough to get off its powerful special attacks and pick the right target, it can be a huge threat. Players had an inkling that Muk would be good, since the popularity of fairy types made poison useful. Plus, by picking up the dark type, Muk turned a weakness to psychic into an immunity and added the ever useful Knock Off to its repertoire. As a result, Muk went from a literal trash Pokémon to something with only a single weakness and the ability to put out a lot of offensive pressure. Muk’s true beauty comes when using the Gluttony ability, which lets it eat berries at higher health percentages than normal. When that is combined with the boosted recovery of the Figy Berry, Muk becomes incredibly hard to get rid of. Now that players have realized this, dealing with Muk requires getting a one-hit-knock-out with Tectonic Rage or taking multiple turns to chip away its health. To truly excel, though, the very slow Muk often needs Trick Room support. With the turn order reversed, it can fire off powerful Poison Jabs, remove items with Knock Off and generally cause trouble. The third slot varies a great deal, though many players choose to run the priority attack Shadow Sneak to pick off weakened foes. However, Curse can come in just as handy for its ability to boost Muk’s attack and defense while lowering its speed. In Trick Room, that not only helps it attack before Pokémon that are naturally slower than it, but it gives it more hitting and staying power. Some players also run Imprison to stop opponents from protecting and to stop other Muks from doing anything at all since their movesets are so similar. Assuming you can take care of any ground type attackers, Muk can disrupt your opponent’s plans and outstay its welcome. Affectionately referred to as “Spider” by the community, Araquanid started off as one of the season’s biggest surprises. While many assumed its terrible offensive stats would keep it from being useful, they soon learned that Water Bubble doubled the damage of its water attacks. Araquanid went on to cement itself as a standard pick for Trick Room teams. Since it’s very slow, it can put its massive offensive pressure to good use when the turn order is flipped. Players tend to run Liquidation, a new physical water attack, to do big damage to just about anything. Waterium-Z is also the most common item on Araquanid, letting it deal massive damage even to Pokémon that resist water attacks. The best, part, though, is that Water Bubble also makes this spider immune to burns, which would otherwise be an excellent way to cut is attack in half. To top it all off, its natural bulk and water/bug typing makes Araquanid a good switch-in option. Even though it technically takes neutral damage from fire attacks, Water Bubble turns it into a resistance. Bug also resists ground, which means Araquanid is a good switch in when the opponent wants to Earthquake. Electric types give it problems, but having a ground type in the back protects it from that damage. Since it’s usually only attacking with Liquidation, its last two slots are more supportive. Lunge is a common backup attack since its STAB and drops the target’s attack stat. Wide Guard is the most popular pick for its last slot for its ability to block any spread attack. Still, Araquanid usually wants to be dealing damage. No one realized how strong Snorlax could be until Markus Stadter won the Leipzig Regional Championship with it. Not only did he win, but he went undefeated in the process. Since that was one of the more recent major events, the top-cut numbers don’t quite reflect how good it can be. Snorlax has Gluttony and access to berries that heal half of its health once it falls below half health. This monster also has base 160 health and 110 in both attack and special defense. It’s also incredibly slow, meaning it works as a great sweeper on Trick Room teams. In fact, some players use it on otherwise fast teams as a way to discourage their opponent from reversing the turn order at all. Its defense is low, but it can shore that up by boosting it with Curse. It has plenty of health and recovery to set a couple up, and don’t forget that it also helps it hit harder, too. Where things get really devious is when Snorlax runs Recycle. With this move, it can recover the use of its item, giving it multiple chances to heal back 50 percent of its health. After setting up a couple of Curses and using Recycle to stay healthy all the while, Snorlax can steamroll teams by itself. Return or Frustration are the STAB attacks of choice, and it usually runs High Horsepower or Crunch for coverage.